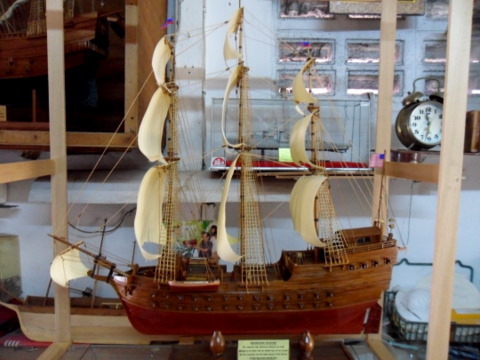 The model warship builder Khun Manoth, lives in the Phrayaprasit community located at the end of Soi Sam Sen 28 with his collection of wooden sailing ships and a long history of model ship building. Initially I had some difficulty in finding his home.But with the help of a kindly neighbor in the community who knew Khun Manoth and where he lived, I finally reached my destination. Khun Manoth Musicabutr welcomed me warmly into his home. 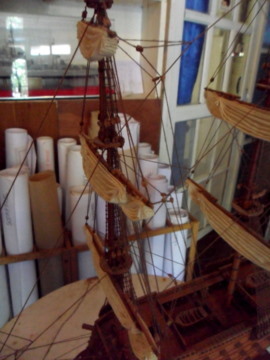 We sat in the first room as I entered his home which served as his workshop filled with his wooden model sailing ships. 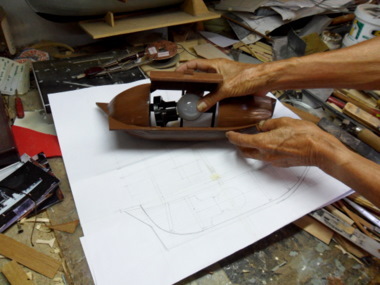 This is Khun Manoth’s story of his career in model ship building that spans 30 years. Khun Manoth didn’t start life as a model warship builder but as an artist, a painter. This is one of his earlier oil paintings of HMS Surprise. He was to build a wooden model of this warship later in his career. Constructed in Nova Scotia, Canada in 1970 as a replica of the 18th C Royal Navy frigate HMS Rose and served as a training ship for the next 30 years. In 2001, it was converted to a replica of the HMS Surprise for a movie. The ship is currently in the Maritime Museum of San Diego. 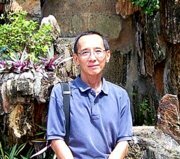 On graduation from the Poh Chang Art College, Bangkok Khun Manoth started his working career as an art designer for advertising firms Leo Burnett and later McCann Erickson. It was when he joined Thai Airways International as an advertising designer that Khun Manoth’s career took a change in course. During one of his working trips to Vienna, Austria he visited an exhibition on model ships. That encounter sparked his interest to be a model warship builder. 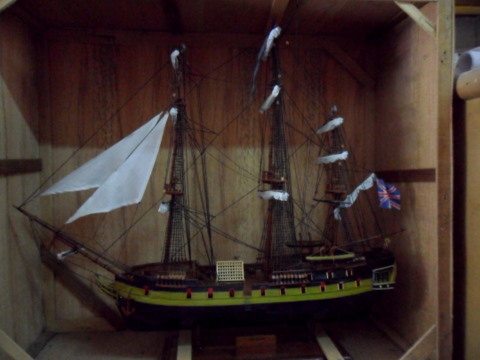 He started building model sailing ships as a hobby. His first work was the Golden Hind, flagship of Sir Francis Drake. That wooden sailing ship took pride of place in his office. Selected by Queen Elizabeth I to sail around the world, Francis Drake set sail from Plymouth Sound in 1577 with the Golden Hind and four other ships. He returned in 1580 with only the Golden Hind. For his sailing feat and in no small measure for the plundered Spanish treasures he brought back to England, he was knighted by the queen on board the Golden Hind in 1581. There’s a full-sized replica of the Golden Hind in Brixham, Devon, UK. 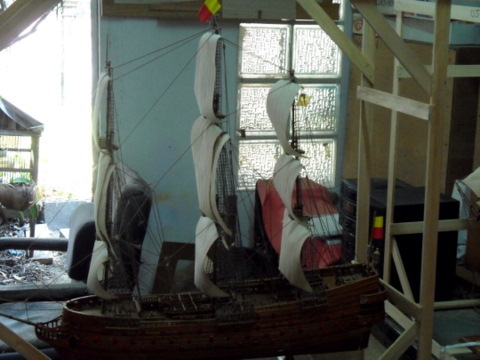 One day, his immediate boss noticed the impressive model sailing ship and offered to buy it for 10,000 baht. You don’t say no to your boss when he makes an offer like that. 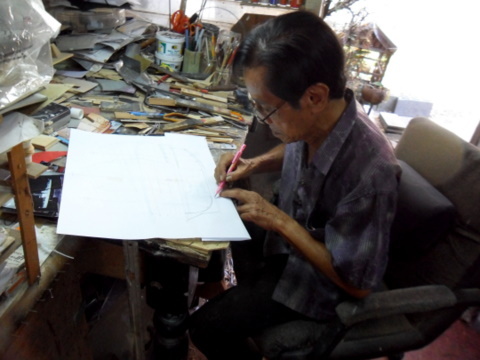 Despite the financial gain, Khun Manoth felt an acute sense of loss for his work of art. 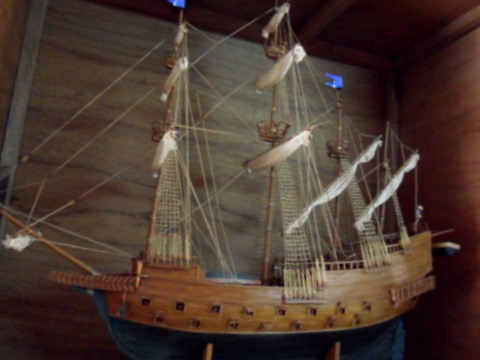 He resolved to build more model sailing ships. 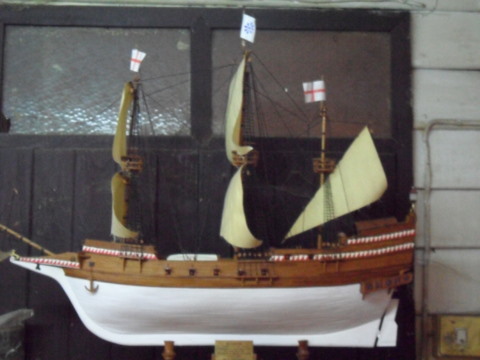 As his skill as a model warship builder spread, more people approached him to buy his model warships. Even his employers, Thai Airways saw his potential as an attraction to promote Thai tourism. He was sent to the Portsmouth Historic Dockyard in Britain twice to study some of the old ships on display. 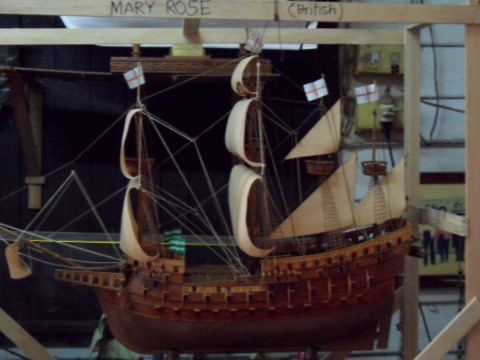 A result of those visits was HMS Mary Rose. Built in 1510 in Portsmouth in the reign of King Henry VIII. It was sunk by the French in 1585 and the remains were recovered in 1982, restored and on display in Portsmouth Historic Yard, the only 16th C warship on display in the world. 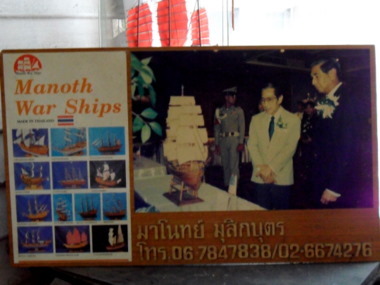 Sometime in the early 1980s, Khun Manoth retired to pursue his passion as a model warship builder. Here are some of the model warships built by him. An ocean going sailing ship with multiple decks of guns used to transport riches from the New World back to Spain in 16th C.
The San Felipe is a Spanish warship between the late 17th C and 18th C with three decks of guns. There were reportedly three versions of the San Felipe during this period. 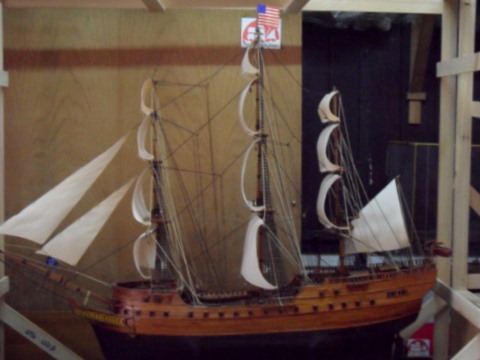 This merchant ship was originally Duc du Duras, donated by King Louis XVI to support the American Revolutionary War. Converted to a warship, it became the flagship of John Paul Jones and was renamed Bonhomme Richard in honour of Benjamin Franklin, American Commissioner in Paris. The name Bonhomme Richard (good man Richard) comes from the French translation of Franklin’s book, Poor Richard’s Almanac or Les Maximes du Bonhomme Richard. In the battle of Flamborough Head on 23 September 1779 Jones engaged the HMS Serapis in a life and death battle. On the brink of defeat with his flagship battered, Jones was offered surrender by the British admiral to whom he famously replied. " I have not yet begun to fight." He went on the capture HMS Serapis and won the battle but lost USS Bonhomme Richard. Launched in 1797; the USS Constitution is the world’s oldest commissioned warship afloat. In 1812 it defeated four British frigates, earning it the nickname, "Old Ironsides". Currently berthed at Charlestown Navy Yard Massachusetts USA, it's open for tours. 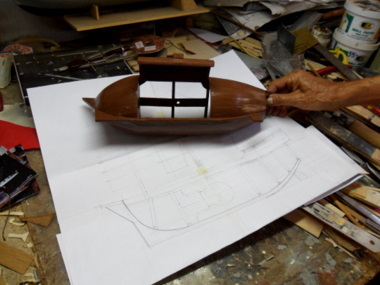 During my visit, Khun Manoth was in the process of building another model ship. 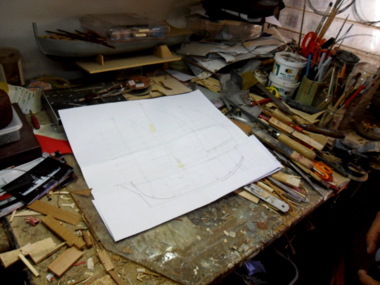 Based on encyclopaedias, photos and surveys of the actual ship, scaled plans are drawn. The wooden hull of this Chinese junk was already completed. A trapdoor was made to fit a bulb to light up the model ship. The completed model ship will look like this. 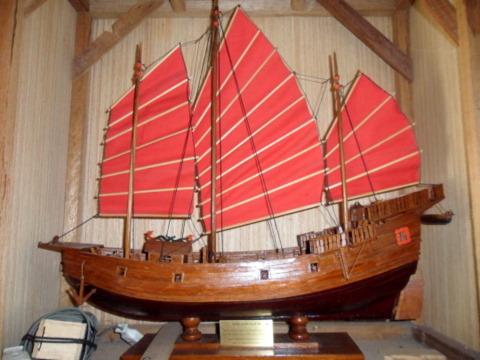 The Chinese junk first appeared in the Song Dynasty 960 – 1276 AD. 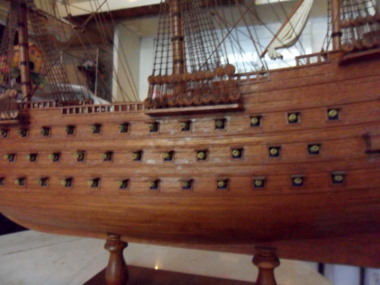 From 13th – 14th C these junks sailed the high seas to SE Asia, India and East Africa. In the late 19th C the junk took on a more sinister role; as a pirate ship preying on shipping between Hong Kong and the South China ports. 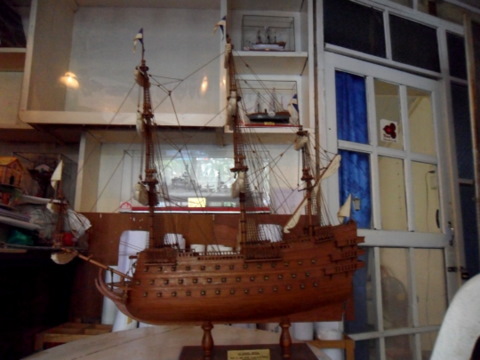 Khun Manoth then showed me his favourite model warship displayed in his sitting room, the Le Soleil Royale (Royal Sun), the pride of the French navy in the 17th C.
Flagship of the French Navy in the 17th C and armed with 104 guns, she destroyed several British and Dutch ships in battle. 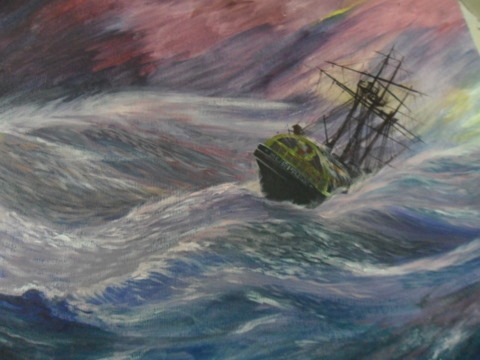 In 1692 while in Cherbourg port for repairs she was sunk by the British and Dutch navies. 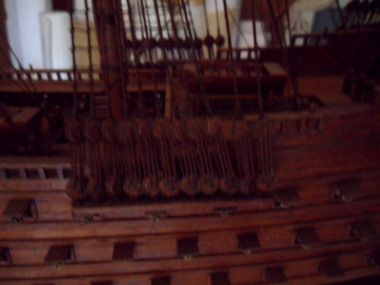 The building of this model sailing ship exemplifies the intricate craftsmanship involved in details like the multiple gun decks and rigging as these photos will show. 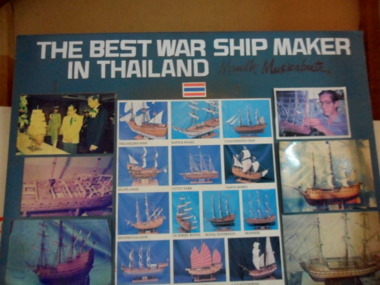 The highlight of Khun Manoth model ship building career was an exhibition of his works in the Montien Riverside Hotel in 1996. He fondly retrieved old newspaper cuttings from the Bangkok Post which he had carefully filed away and proudly showed them to me. The reviews for the model warship builder were in glowing terms. Look out for the Bang Kra Bue intersection. Get off at the bus-stop immediately after this intersection. Soi Sam Sen 28 is on the right. You can either walk in or take a motor cycle taxi to get to the place. 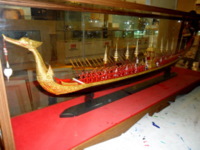 Khun Manoth conducts classes in model ship building. The course fees are 5,000 baht. There’s no time limit to the course. 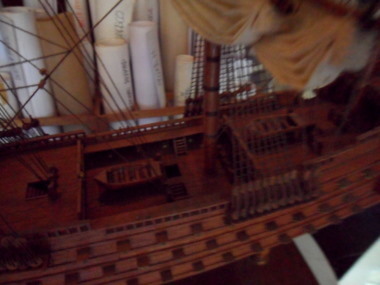 Learners complete the course when they are able to complete a model ship to take home. 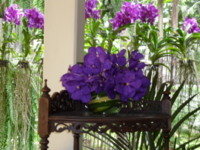 Khun Manoth receives visitors on Mondays, Wednesdays and Fridays from 10 am – 4 pm. My sincere thanks to Khun Manoth Musicabutr for his warm hospitality and for sharing his experiences in his model ship building career. I could just sense his enthusiasm, his pride and joy in his work as he showed me his various model warships. They were the labour of love. What struck me too is his modesty, the fame and fortune never got to his head. 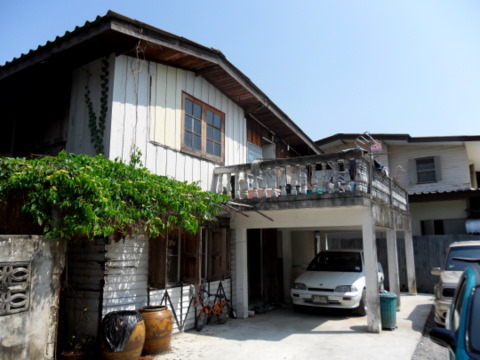 He points to his modest home, the old car in the driveway and relishes his meal of a 30 baht bowl of kwai teow (noodles). I am honoured to have met a master model warship builder and a true craftsman. To return to Traditional Thai art.